There have been a lot of signs pointing to 2016 being the Cubs’ year, but this may be the wildest yet. "Chicago Cubs, 2016 World Champions. You heard it here first," the quote under Michael Lee's name reads. Marcos Meza shows his 1993 yearbook from Mission Viejo High School, featuring a quote predicting the Cubs will win the World Series in 2016. Fast forward to 2016, and the Cubs are headed to their first World Series in 71 years. “In high school we graduated and I saw that quote and I thought it was a funny quote,” said Mission Viejo High School alum Marcos Meza, who said he has known Lee since seventh grade. Lee was from Chicago but raised in California, Meza said, and always maintained his allegiance to the Windy City. The two friends had lost contact after high school, but connected on social media in 2009, when they first reminisced about the yearbook prediction that was just seven years away. “I told Mike, ‘Dude you had the coolest yearbook quote,’” Meza said. Michael Lee could not immediately be reached for comment on the story. Meza, a Dodgers fan, said he didn’t think the prediction would come true — until the Cubs beat the Dodgers in the NLCS. 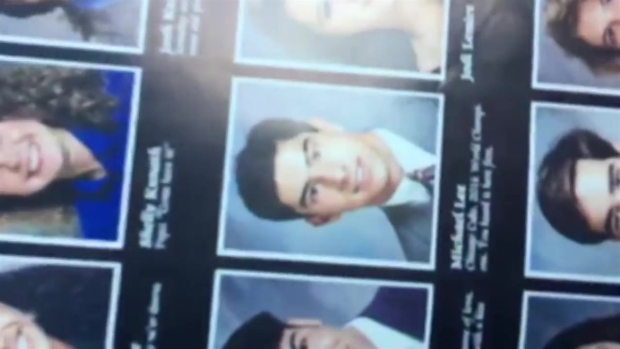 After he shared the image, other photos of the yearbook began popping up on Twitter and Reddit. Meza said as the photo gained traction on social media, many people questioned if it was photoshopped, so he took videos of his yearbook to verify them. He said he knows Cubs fans are superstitious but he believes the 23-year-old prediction isn’t a jinx, but fate.